Nursing is ever changing and didactic. The practical nurse student must commit to keeping abreast of advances and changes in the health care field. By keeping abreast of advances and changes in the health care field, the practical nursing student can adapt these changes to his/her nursing practice. The mission of Compass Career College’s Practical Nursing program is to prepare its students to provide nursing care that follows the guidelines established by the Louisiana State Board of Practical Nurse Examiners (LSBPNE). Our goal is for graduates to meet licensure requirements for Licensed Practical Nurse (LPN), as established by the LSBPNE, and be able to provide nursing care by meeting physical, social, emotional, and spiritual needs of clients throughout the life span in all nursing settings in which the LPN practices. Few things in life are as gratifying as watching the transition from student to professional. With tailored, one-on-one instruction, we’ll make it an easy one! Think you might need a little extra help? Our passionate instructors want to see your flourish, and are ready to dedicate the time to help you succeed. The Practical Nurse (PN) program has limited enrollment. The applicant's testing scores and completion of the application packet will determine conditional acceptance by Compass Career College. Acceptance by Compass Career College is pending approval by the Louisiana State Board of Practical Nurse Examiners (LSBPNE). Nursing is an art and science based upon principles drawn from the biological and behavioral sciences and nursing theory. Nursing requires critical thinking, clinical skill, judgment and knowledge to provide safe nursing care. The nurse works with the client to maximize the client’s potential on the health-illness continuum. Nursing is a practice discipline with cognitive, sensory, affective, and psychomotor performance requirements. Review the Core Performance Standards with a physician and/or nurse practitioner to determine your ability to meet the program performance requirements with or without reasonable accommodations. 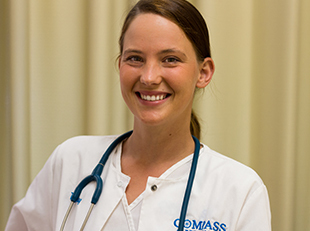 Get your nursing education at Compass.